I don’t remember why I picked up Maggie Nelson’s book sometime last year; someone had said something positive about it, and I always feel guilty about not reading enough contemporary work. But I took it home & made my way through the not inconsiderable credits at the back of the book & found myself losing interest, and I put it back on the shelf. 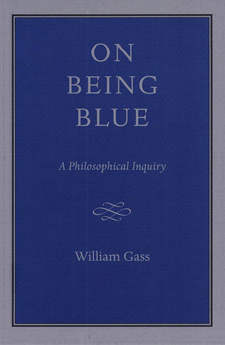 It seemed odd, I thought, almost inconceivable, that someone would write a long essay (or a short book) about the color blue when William Gass’s perfectly nice On Being Blue existed in the world, and was still in print. But I found myself thinking about Gass’s book when reading Thomas Browne in Libya: reading The Garden of Cyrus, it became entirely clear where Gass had taken his form for On Being Blue – starting with a concept, almost arbitrary; then moving through digressions to end up in an entirely different space. There’s something comforting about this: reading something and realizing that others that you know have been there before you. But with this realization, of course, there was the need to go back to Gass, to see how he’d changed since I’d last read him – I think I first read this book around 2001, though I could certainly be wrong – and whether the work holds up. And of course there was the Nelson book on the shelf, which I found myself resolving to be unfair to. And while reading Browne I found myself thinking about the color blue: at about the same time, we were spending a lot of time driving through the sand seas of the Sahara, and I found myself fixated on the line between sand and sky. Partly this is because the desert is aesthetically barren: there are only two elements, and the sky was uniformly blue, the sand was uniformly orange-yellow. As evening approaches, shadows appear, which change things; but until then, there is the horizon. Next to the sand, the blue of the sky pops in an astonishing way: it’s hard to imagine how any blue could be more blue. There was the urge, with a blue so intense, to capture it somehow; I was taking photos with my iPhone, which I knew very well does not take the best photos in the world, but it was hard to fight off that urge to capture that blueness. It’s hard not to have some sort of aesthetic experience in a space like that – in the same way that it’s hard not to when standing in front of Monet’s Water Lilies in the Musée de l’Orangerie. Blue summons up feelings of the infinite; one understands immediately why people feel the urge to write books about the color. Off the top of my head, I can think of Alexander Theroux’s The Primary Colors (which widens its interest to include red and yellow) and Joshua Cohen’s more narrow “Thirty-Six Shades of Prussian Blue” to stay outside of writing about the visual arts; Kandinsky’s Concerning the Spiritual in Art nails down his weird theory of precise meanings of colors and shapes; and of course there are Albers and Goethe and Wittgenstein, and we could go on. I could be content that we might procreate like trees, without conjunction, or that there were any way to perpetuate the world without this triviall and vulgar way of coition; It is the foolishest act a wise man commits in all his life, nor is there any thing that will more deject his coold imagination, when he shall consider what an odde and unworthy piece of folly hee hath committed; I speake not in prejudice, nor am averse from that sweet sexe, but naturally amorous of all that is beautifull; I can looke a whole day with delight upon a handsome picture, though it be but of an Horse. Gass’s book is an argument about the relation between words and the world, the experience of blueness tying them together: depiction (like Browne’s portrait of a horse) is different from personal experience. 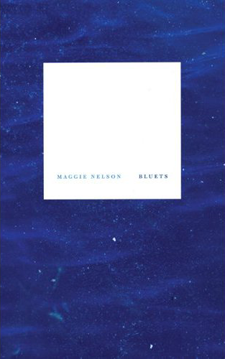 Nelson’s approach to roughly the same subject is messier: in numbered paragraphs, she examines her personal experiences with blueness, drawing in a predictable series of artists and works as evidence (Yves Klein, Rose Hobart, poor old Wittgenstein), trying to discern why blue is important to her personally. Because Nelson’s book is constructed aphoristically, she moves on; this is frustrating, because this isn’t really an argument so much as a stance of defiance: her blue is entirely hers, and there’s little space in her book for the reader. William Gass’s “Retrospective” at TriQuarterly. Capital New York on the Roerich Museum. An interview with Marc Lowenthal of the wonderful Wakefield Press. Robin Kinross on the designer as publisher, with news of Richard Hollis’s new press. And video of arguerite Duras reading L’Amant. Martha. A list lost reminds her of a fire lost. Smoke is not black nor if you turn your back is a fire burned if you are near woods which abundantly supply wood. Maryas. A list lost does not account for the list which has been lost nor for the inequality of cushions shawls and awls. Nowadays we rarely mention awls and shawls and yet an awl is still used commercially and a shawl is still used is still used and also used commercially. Shawls it may be mentioned depend upon their variety. There is a great variety in calculation and in earning. Martha. There is great variety in the settlement of claims. We claim and you claim and I claim the same. Mabel. I have also had great pleasure from a capital letter. Mabel. And they collect them as lilies of the valley in this country.